As an nail artist (or artiste as I like to call myself) I try to stay abreast of the nail trends professional nail techs are buzzing about. One such trend is the concept of layering nail colors to create custom colors for customers. The idea of layers is not a new one for me…you need only scroll through my previous posts to see that I’ve been layering colors to create fading effects before I knew it was a trend. Fun Fact: I actually took serious art classes for years as a kid with a group called Young Artists & Co.—charcoal, pencil, oil paint, watercolor, and acrylic paint, and a little bit of mixed media/sculpture. When I got into nail art last year, I learned that nail polish can behave like an oil paint in that you can use a palette to mix colors then apply the combination to the nail but nail polish also behaves like watercolor in that you can layer colors on top of each other to create something completely new. Among professional nail artists/techs, it seems some clients are no longer looking for the new hot line of colors from their favorite professional nail polish brands…clients are looking for custom colors, created on the spot just for them. In comes layering. Now the professionals are layering Minx, gel, acrylic and all sorts of other nail materials. Me? I’ve got polish…and jelly polishes work well for layering because the formulation is often less pigmented. For this look I’ll be giving you the step by step for how I created this oh-so-sparkly-glittery design. While the pros are using layering to offer custom colors to their clients, I believe layering can stretch the at-home nail diva’s collection infinitely. Imagine the possibilities! 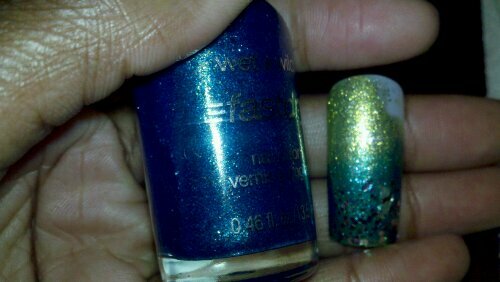 I started out with 2 coats of Wet n Wild Fast Dry in Ocean Grotto, a fun yellow-green shimmer jelly polish. You may notice a bit of Visible Nail Line (a term I’ve often seen used by the editor/owner of All Lacquered Up) with these 2 coats. If I was going to wear this color alone, I’d definitely add a 3rd coat, but I’m not…there are more layers to add! For the next layer, I covered my entire nail in a thin layer of Orly Tiara, a jelly-based silver glitter polish. I had to keep that layer thin because it is CHOCK FULL of glitter. Seriously, Orly has some of the most dense glitter polishes in existence. I’m really looking forward to removing it…NOT. At least there’s a relatively quick trick for removing glitter polish. Click the link for the method I use. Next I added a layer of Wet n Wild Fast Dry in Blue Wants To Be A Millionaire, a light blue shimmer jelly polish, to the bottom half of each nail, closest to the free edge. Last I added a layer of Wet n Wild Fast Dry Party Of Five Glitters, a jelly-based glitter polish with 5 different glitters of varying colors, sizes, and shapes, along the tip of my nail, much like I would have done a white tip in a French manicure. Voila! A custom color, packed with glitter and shimmer :-D.
Just to give you a peek into the thought process that goes into my nail art. The fake nail on the right was what I decided on for this manicure but my runner up was the nail on the left. I tried several other colors for the contrasting color (I knew I wanted Ocean Grotto for the base) but most of my polishes are very pigmented professional brands. As it turned out, this drug store brand polish had enough pigment to *pop* but not so much that I couldn’t do the layering technique. I used Wet n Wild Fast Dry Teal of Fortune in the nail on the left.